At the awards ceremony for the Great American Beer Festival — the biggest craft beer celebration in the country — it's best for brewers who've entered their creations into the contest not to get their hopes up. At least that's how Perry Street Brewing owner and brewer Ben Lukes went into it. In all, 7,227 beers from 1,752 breweries were entered this year in the Denver-based contest. Sure, there were 96 different categories at the 35th annual event, held Oct. 6-8, but even then, that's a lot of competition. Lukes and a couple of Perry Street employees were seated up near the rafters of the massive auditorium that holds the awards ceremony. After a few categories went by, it was time for the Session Beer category, a vague classification used to describe low-alcohol yet flavorful beers. Bronze went to a Virginia brewery, silver to an oatmeal stout from San Diego. Then, the gold — Perry Street Brewing, for their Session India Pale Lager. Lukes and company went wild. Now, the only issue was finding a route to the podium to accept their gold medal. "The adrenaline was flying. We were running through the halls trying to get down there," says Lukes. When they got to the stage, PSB kitchen manager Alisha Van Guilder was quick to FaceTime Lukes' assistant brewer Riley Elmer, who had to pull out of the trek to Denver due to an injury. "Riley got a fist bump through the phone and he got to see the crowd and everything. It was wild," says Lukes. Now, folks are clamoring for the Perry Street IPL. The thing is, it's a summer beer and Lukes had no plans to brew more this late in the fall. But bars have been calling in asking to order it, and two guys from Seattle even drove over explicitly to get a taste of the ultra-clean-tasting lager that's brewed with a Czech yeast. Fear not: it's coming back. There's a double batch fermenting right now. 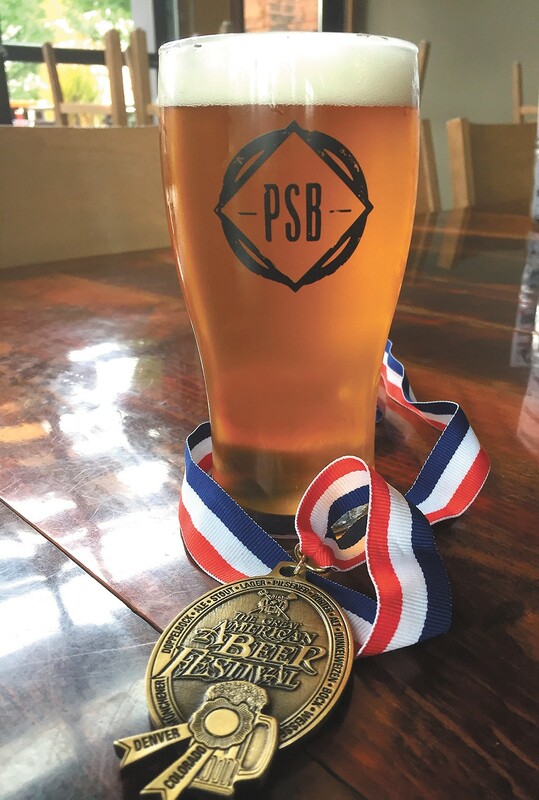 "Because we hit gold, we're going to roll this baby out there into the world," says Lukes, adding that the IPL will now become a permanent fixture at Perry Street's pub in the weeks to come. The other Inland Northwest brewery to get a shout-out from the Great American Beer Festival stage was Kootenai River Brewing Co. from Bonners Ferry, Idaho, which took a bronze for its McGregor Scottish Ale. The state of Washington also fared well: Georgetown Brewing in Seattle took home gold in the American IPA category for its Bodhizafa IPA.